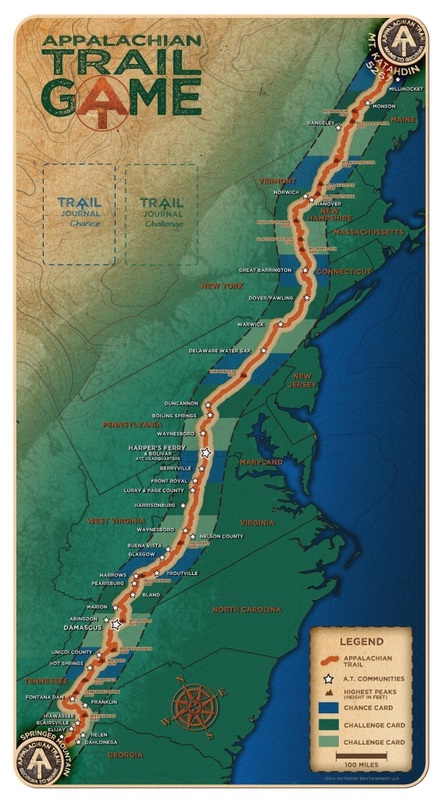 Recently a new Appalachian Trail themed board game was successfully funded on Kickstarter in August. How do I know this? Because the game ended up under my Christmas tree along with a few other hiking themed gifts (can’t say that wasn’t expected). 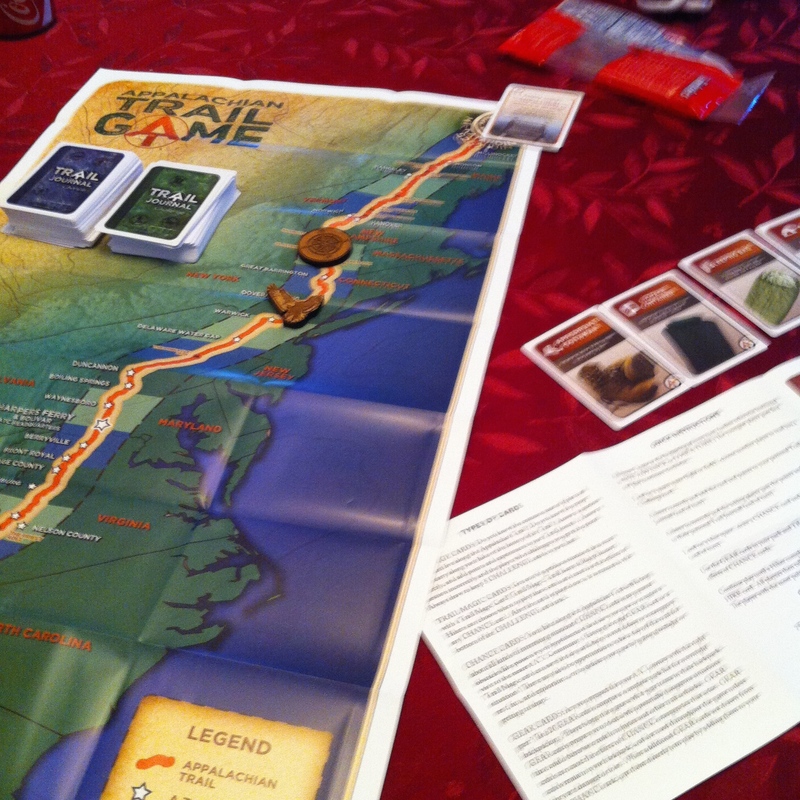 This board game, creatively dubbed “The Appalachian Trail Game”, was an unexpected but really enjoyable gift. Initially, my father and I played alone as everyone else in the room felt we’d have an unfair advantage and wanted nothing to do with being absolutely demolished. We unwrapped the game to find a beautifully carved, wooden display box. The box contained an AT Game Board Map, 4 Engraved Playing Pieces (Hiking Boot, Eagle, Compass and Couch), 2 Decks consisting of 150 AT Game Cards, and instructions. After drawing 4 GEAR playing cards to determine the makeup of our backpacks, drawing 5 CHALLENGE cards, and choosing to hike northbound (because, consistent), we were ready to play. At the beginning of every turn we would advance 1 space and land on a colored space. If we landed on a light or dark green space, we choose another player to read a CHALLENGE Card from their hand. These CHALLENGE cards ranged from fun trivia questions such as “How much does one gallon of water weigh”, to identification questions requiring you to look at a picture of a plant or animal and give the proper name. When I answered the CHALLENGE question correctly, I got to add the card (and the point value of the card!) to my Trail Journal stack. If I answered incorrectly, the asking player (in this case always my dad) got to keep the card and the points. Other times we landed on a blue space, in which case we would draw a CHANCE card and follow the instructions. CHANCE cards ranged from “Get in Shape! Increase your mileage each day through developed strength & endurance – Advance One Space” to “Heat Wave! All Hikers stop to hydrate and avoid heat exhaustion after hiking in extremely hot and humid conditions. All Players do not advance next turn unless they are carrying sun protection or a water bottle”. Sometimes CHANCE would be bad – like, “Twisted Ankle! Stay in camp an extra day to rest and recover or hike ahead if you are prepared! Do not advance next turn unless you are carrying two of the following items: Appropriate Footwear, First Aid, or Trekking Poles “. So you were always lucky if you had a TRAIL MAGIC card or GEAR card from earlier in the game that let you solve the problem without having to “return to the nearest AT community”. We continued playing in this way until one Hiker completed the A.T. and earned the THRU HIKE card at the end. After tallying our points from our Trail Journal, it was clear who the winner was — that winner was me. Overall the play of the game was really simple but was also really fun. Some was up to chance (ha), like who would happen to have the right pieces of gear in their hand to make it through the rainstorm. Other things like identifying a “Jack In The Pulpit” flower by sight neither of us could do despite successfully completing a thru-hike. This is a game anyone at any age and any experience level can appreciate. If you’re new to hiking, you learn some fun trivia and important gear facts. If you’re a pro hiker, you still learn a few things you didn’t know and get to walk down memory lane while doing so. The developers did a great job on this board game, and I especially appreciate that anyone can submit card ideas to be added to future expansion packs. 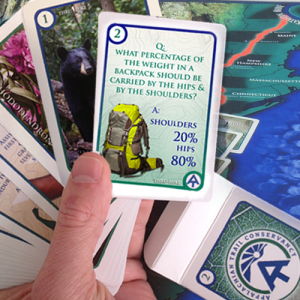 That way, even if you play through all the trivia cards now, soon there will be even more questions to keep the Appalachian Trail board game, just like the Appalachian Trail itself, always new and interesting. Hi! I'm Bennett "Tandem" Travers, a 25-year-old University of Georgia alumni. Despite working in Digital Innovation now, in 2014 I left technology behind and thru-hiked the Appalachian Trail with my dad. How do I know my order went through? I had a hard time doing it. I could not find a phone number to call. Would like to know if you got it ok.
How do I know you got my order ok. I had lots of trouble ordering.